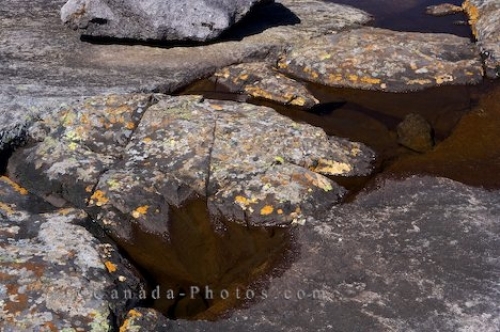 In each rock crevasse beside a waterfall during the summer months in the Mealy Mountains in Southern Labrador, small pools of water form creating a unique landscape picture. Small pools of water collect in the pockets around the rock formations beside a waterfall in the Mealy Mountains in Southern Labrador, Canada. When summer arrives in Southern Labrador, these small pools become plentiful as the water is not rushing down the mountain as quickly. In the spring and fall, the small pools are scarce due to the increase in water that flows down the mountainside. Rocks and small pools of water beside a waterfall in the Mealy Mountains in Southern Labrador, Labrador, Newfoundland Labrador, Canada. Picture of small pools of water beside a waterfall in the Mealy Mountains in Southern Labrador, Canada.